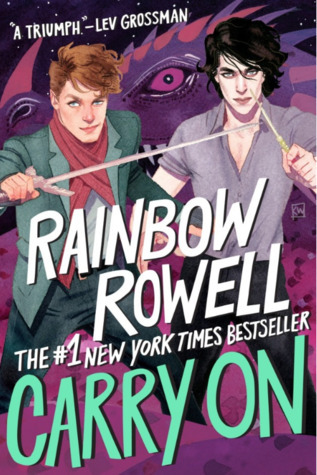 #BookReview: Carry On by @rainbowrowell @GriffinTeen Now in Paperback! RAINBOW ROWELL lives in Omaha, Nebraska, with her husband and two sons. She's also the author of Landline, Fangirl, Eleanor & Park, and Attachments. I want all your books!! Signed by the authors!! I thank St. Martin's Press so much for the paperback copy of Carry On!! I died when my mom texted me saying it had come!!! Carry on was a great book. It had a good storyline as well as good characters, setting, and pace. I was interested in this book because fanfiction isn't usually published. So I thought of this story as unique and different. I think the romance between Simon and Baz was adorable. I don't find that many gay relationships in regular books. I usually only find them in manga, anime, or fanfiction, as well as fan art. Simon was my favorite character I thought it was funny, I thought it was nice that he asked himself if he was gay. It really showed how he grew as a character throughout the story. I also liked that Baz asked the same thing as well. I also felt sorry for Simon as he always thought he couldn't go into relationships because he was terrible and worked more than paid attention to them. He questioned himself which I figured was why he's my favorite character. Becuase, I also do the same thing. Simon also was annoyed that he was the chosen one and that he could get other people hurt. The rest of the cast in this book were great. But, they didn't really click with me like Simon and Baz did. This book was fantastic. The book switched between multiple POVs and had a great pace. It explained many reasons why they did certain things and what they thought. I liked the fantasy side of the book as well. But the ending was my favorite part. I was actually sad when the book ended, I wanted more. I really hope for a book two. I know every series must come to and end, but, a book two would be nice, or a nice thought. Fans of Harry Potter will love this story! Yes Rainbow (coolest name ever) I am stalking you!